Dan Willard began playing the sax in high school and performed in the school jazz band and The Fabulous Esquires Big Band. He studied privately with Richard Firth. After high school he studied music at El Camino College and CSULB playing in their jazz bands and other ensembles. 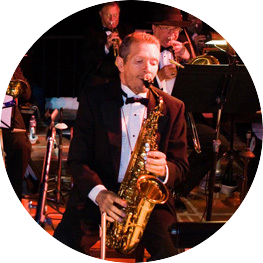 Dan has played saxophone with numerous big bands, jazz bands, Dixieland bands, and rock bands including Swing Shift, The Ojai Mardi Gras Band, Ulysses Jasz, and The Untouchables. Dan has performed numerous musicals on saxophone including Guys and Dolls, West Side Story, Cabaret, Legally Blonde, Curtains, Spamalot, Anything Goes, Beauty and the Beast, The Pajama Game, and The Music Man. In 2002 Dan played sax on an album of Dixieland standards called How Jass Music Is Made with The Untouchables. Dan also plays sax in recordings of his own compositions and in collaborations with other artists. Dan continues to play sax in musicals and with his own Dixieland band, Dan Willard and His Old School Jazz, his own jazz band, The Dan Willard Jazz Band, and his own big band, The Ojai Big Band. He teaches private sax lessons at Ojai Valley School, the Thacher School, and at his home in Oak View. He plays soprano, alto, and tenor saxes.